It is not fair to love a country because it appears to be backward—although I could name half a dozen towns in Western nations that make handsome currency off their refusal to enter the twentieth century. I treasure in Poland an Old which is hard to come by in the West. This nation goes back centuries, and despite fifty years of communist reconstruction and centuries of floating borders, outcroppings of these old deposits show in every aspect of Polish life. Whatever this curious synthesis is, it will not last long: the paradoxical cohabitation of managed economy and free-market capitalism; of militant Catholicism and, still, a lot of communist mental references; of cheap tram service to the edge of the countryside and shiny metallic-blue VWs, silver-gray BMWs and bright yellow Mercedes; of horse-drawn hay ricks and satellite dishes pirating Sky TV; of All Saints Day cemetery vigils and visa-free travel to Germany and beyond; of traditional street markets and smart private shops; of street workers sweeping sidewalks and streets and even the lawn itself with their twig brooms and the influx of expensive Western goods prized by Poles. Whatever this curious synthesis is, it will not last long. And since it is impossible to imagine this country slipping backwards further into the nineteenth century, and given Poland’s historic attraction to the west (previously France, now “America,” which in glazed Polish eyes does no wrong), and since the West is the land of all things new, I conclude it will be the old elements of present Polish life that will disappear, precisely those things that most stir my imagination: steam locomotives and wicker shopping baskets filled with eggs or garden produce; clean-up crews with their two-wheeled, hand-pushed carts hauling cardboard boxes down the center of Kościuszki Street to the recycling center off of Zachodnia; flower venders sitting on stools and crates behind plastic buckets filled with pink gerbers and red roses at every busy corner of Łódź; tin dinner pails in the hands of workers on their way home from small factories to country houses; vest-pocket specialty shops for meat and bread, ma-and-pa groceries 200 steps from each flat, and corner venders of fresh vegetables in late summer and early fall; glass bottles of unpasteurized milk; butchers hacking away with black mediaeval curt axes at the corpses of freshly slaughtered pigs, head and feet in full view and for sale on the table in front of them; the wooden sleds that appear each winter, bolted together, rusting steel blades covering each runner, pulled on twine ropes and carrying, always, some ruddy-cheeked, heavily bundled youngster of two, strapped bolt upright into his seat; the open air markets where you can buy a bundle of fresh twigs for your broom, or a wicker shopping basket, or pickles from the barrel, kraut from the crock, cheese from the wheel. Aluminum milk cans lining village streets in the early morning, one or two per home, awaiting pickup by a man on a heavy Ursus tractor or a horse-drawn cart. The fur hats of red, gray, silver, white, black, brown that appear the first really cold day of winter, turning a bouncing bus into a sea of rippling fox, rabbit, wolf, mink. The old cobblestone walks, and the paved-over streets, cheap macadam bearing the imprint of automobile tires, red paving stones showing through holes in the crumbling asphalt. Even the drab, dull cement walls of buildings, chipped and scaling, red brick beneath flaking cement, buttressed (I have seen this) with pine trunks or steel girders wedged at an angle between sagging wall and earth. The trams, their worn wooden seats a yellow luster in the night, radiating a soft warmth as they clatter through empty streets. The bent women in faded floral dresses, graying sweaters, and black coats, on their way to market. The rose gardens in front of each apartment, so carefully tended. This nation goes back centuries. It is not fair to love a country because it appears to be backward—although I could name half a dozen towns in Western nations that make handsome currency off their refusal to enter the twentieth century—but that’s not exactly what I was saying. If Poles love the West because to them it represents a Future in which they believe as fervently as Jay Gatsby believed in the green light at the end of Daisy’s dock, I treasure in Poland an Old which is hard to come by in the West, especially in the America where I live. 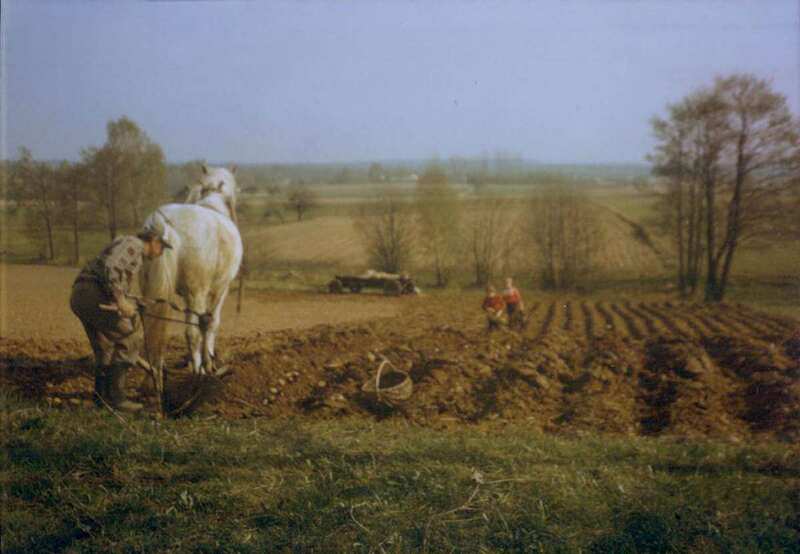 This nation goes back centuries, and despite fifty years of communist reconstruction and centuries of floating borders, outcroppings of these old deposits show in every aspect of Polish life. Writing in the New York Review of Books , Neal Acherson once observed, “Poland is full of time zones, constantly crossed by people who seem to be migrating from the eighteenth century, or even further back, toward the present—some completing the journey, many disembarking in the landscape of the 1830s Romanticism, other preferring the Positivism of the late nineteenth century, others again alighting after 1900… It is seamed by broken and faulted zones of locality.” Poland’s attraction for me has been the way various components of its landscape call to sympathetic elements in my own fifty-year-old self. Some zones speak to a personal history, to memories of my childhood; others touch something more communal, something deeper, more mysterious, more hidden: tales my parents told me, stories of their parents before them, a life I have learned from books and old magazines. I am a prisoner here of my own experience. On the simplest level, Poland in 1990 represented what in my naiveté I thought Europe always was and always should be: comfortably cheap, a little broken, vastly rich in monuments, scenery, and smelly restrooms guarded by little old lady attendants. I am a prisoner here of my own experience, having grown up with a post-War Europe a good deal more cheap and broken than Paris and Berlin, Vienna and London have historically been. Today those cities—each substantially more expensive than New York or Chicago, and more vibrant at least than New York—are closer to the historical norm than the London, Paris, Berlin I visited as a wide-eyed youth three decades ago. Who can afford them today? And why shell out that kind of money for an upscale parody of what you left behind? Poland in 1989 was still the old story. Bashevis Singer; World War I and II television documentaries; visits to reconstructed enclaves of the American past like Sturbridge Village, Massachusetts or Pioneer Village, South Dakota, to abandoned farm sites in southwestern Minnesota, to ghost towns in Wyoming, to decaying miners’ dwellings in West Virginia and Kentucky, the weathered boards, the cracked plaster, the broken fences, the chimney stones in a heap in the cellar, the rusted tin pans and rotting leather harnesses and broken shards of glass in gray window casements. From childhood fairy tales, legends, old myths, from the depths of dreams and the dark recesses of my own subconsciousness, images leap out, drawn by some psychic charge in the Łódź landscape. I do not board a Polish tram without once again boarding the old Suburban Trolley which ran from Media, Pennsylvania, to 69th Street, Philadelphia, during my high school years. I do not see a worker shoveling coal into a Łódź cellar that I do not think instantly of the coal cellar where Billy Allison and I played ourselves black in Buffalo, New York, in 1953; and of the converted coal cellar of my old Peoria house, where I built my son’s box-hockey game, and my daughter’s doll house. The typewriter on which I write this manuscript is the very image of the typewriter my father used at Muhlenberg College in the thirties, and passed to his son when I left Philadelphia for Wittenberg, three decades ago: a black manual portable with no key for open and close parentheses, and if you make a mistake, it’s reach for a pencil with an eraser. The roundhouse at Skierniewice is home to half a dozen black steam engines, and in every Polish railroad station you’ll see at least one water tower at which an old engine can belly up. In 1990, steam locomotives were still used for occasional yard work in Białystok and Kutno. The brooms used by Polish street workers are precisely the brooms ridden by black witches silhouetted against orange moons on American Halloween decorations, the kind of brooms you can’t find in America, that disappeared from Western Europe two decades ago. The brooms used by Polish street workers disappeared from Western Europe two decades ago. Whenever I see a merchant weighing carrots or apples or live chickens in his iron balance scales, carrots in one tray, iron weights (or makeshift equivalents) of .5K, 1K, 2K, in the other, I think of the antique balance scale on my father’s family room shelf in New Market, Virginia. Every wooden implement in daily Polish use belongs in the collection of old wooden farm tools bought at Virginia auctions and hung on his family room walls. And when Tom Bednarowicz announced happily that he finally found a good, heavy duty aluminum kettle for his folks, something they’d been wanting for a year, I told him that I’d seen one sell for $18 at a farm auction just before I left the States. As an antique. Entering the Institute of English Philology and looking toward the ceiling light fixtures (concentric circles of cream colored plastic), I gaze directly, again, at the ceiling of Herbert Hoover Elementary School, Kenmore, New York, erected in 1952. I cannot see a child run up to touch a chimney sweep from behind without being transported instantly into Mary Poppins . And in Poland, chimney sweeps are nearly as common as nuns, priests, and monks… young nuns, priests, and monks. Nowhere in America are chimney sweeps and twig brooms, iron balance scales and wood-seated trams, wicker baby carriages and 1949 Hudsons integral components of daily life. Poland is the chance of a lifetime for a Westerner to come home… or it was when I was there. Poland whispers as well to a human history which comes locked in recessive genes, in dusty atoms on distant branches of the DNA molecule, a history which is not mine personally but could have been. I know this history from books, fairy tales, dreams, and Jungian psychology. On the streets of Łódź troops first fired on factory workers demanding work and bread in 1905. Every journey was an exploration of some great archetypal landscape, urban or rural: figures bent and twisted, a dead drunk at our very tram stop, storks in their nests atop barns and telephone poles, an old horse-drawn Black Maria clattering through the cobblestoned backroad of a remote village, the thatched roof on a farm outbuilding. In Bałuty, the old Łódź ghetto, 200,000 Jews produced 5,000 German uniforms a week. They all died. Rumkowski, the Eldest of the Jews, selected “volunteers” for “relocation.” They all died. Rumkowski himself rode the last train to the extermination camp. This brick rubble we kick up when we scrape the earth with our boot heel is the siftings of people’s lives. It’s believed that bodies may lie buried underneath those trees. Finally there is the intangible of Slavic soul, that great underground reservoir of suffering and vitality, described by Miłosz in Native Realm as “a sudden ebb or flow of inner chaos.” Like Afro-American soul, Native American soul, Latin American soul, Slavic soul is difficult to define, impossible to impersonate, but you know it and love it when you feel it. To a base of mystery and remove, add traces of ecstasy and terror, fervor and indifference, generosity and cruelty, light and dark. Don’t be afraid of too much dark. Here is the Eastern “right brain” to the Western “left brain”: spontaneity to Western structure, intuition to the Western reason, the collective to Western individualism, emotion to Western restraint. In the land between Berlin and Moscow a Westerner enters, with a curious feeling of déja vu, the long-lost Other. And as he struggles to comprehend this half-remembered landscape, a long-repressed secret self emerges, something dark and moist and messy, vaguely out of control, oddly comfortable. Call it the dark side. Call it the Id. Call it Slavic soul. This rational Westerner calls it home. It’s the third chapter of the book by David R. Pichaske. Visit our website next week to read the next part of this extraordinary journey to Poland between 1989 and 1991.